Discussion in 'Music Corner' started by Paulette, Oct 20, 2017. 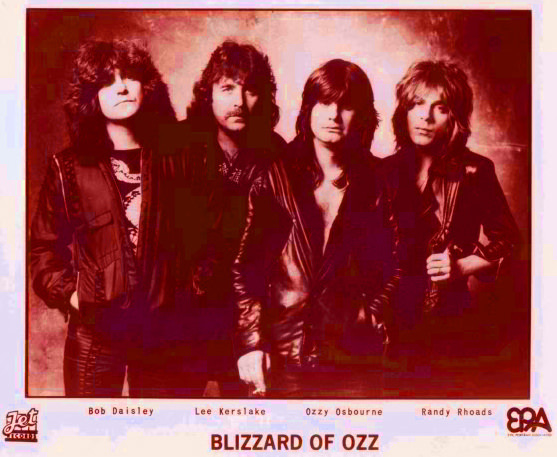 Blizzard of Ozz was a band, true, but Blizzard of Ozz is Ozzy's first solo album. It doesn't really matter how much work Ozzy put into the album's creation. He has the name recognition and the voice that the public had already connected to. The other guys were nothing without Ozzy, and Sharon knew it. fluffskul and Paulette like this. Well, my friend, we obviously disagree. here's a publicity shot from Jet records clearly naming the band BOO. Efus, Doggiedogma, squittolo and 2 others like this. Very cool. I've seen this shoot but not labeled. Oi, Ozz is gorgeous. What a good lookin' band too. Thank you. HardTimesRoughLines, Fullbug, Paulette and 1 other person like this. Bottom line for me is there is such a vulnerability in all of his imperfections that make him perfectly loveable... I'm so glad I live in a world with Ozzy Osbourne. weekendtoy, Shvartze Shabbos and Paulette like this. And listen to that demo he and Ozzy did of walk on water. I've played that for quite a few studio owners around here in DC and they can't believe that's Ozzy singing. Just amazing control of vibrato, pitch, etc... the harmonies are incredible. Fairly dry mix without the flangey echoey stuff typical of how most mix his vocals. He was sued in the 80's on a ridiculous claim that his music inspired a fan to kill himself. Ozzy won but received negative coverage in the press. He was an easy target for anyone claiming heavy metal had a negative influence on teenagers. Genghis Khan, Napoleon and Hitler didn't need metal or vid games to make them do what they did. That reinforced my statement... he's a very genuine, warm person... he's not perfect, he's not a shark, he's not manipulative... he's just Ozzy... when he says "I love you all!" you can just feel that he truly means it. weekendtoy, Paulette and ajawamnet like this. The other guys were nothing without Ozzy, and Sharon knew it. And Ozzy has been lesser of an artist/entertainer without those three guys. While I enjoy his solo output up to Ozzmosis, the Blizzard Of Ozz band had something special. Shvartze Shabbos, Doggiedogma and Nomadicarchivist like this. If “those other guys” were truly “nothing without Ozzy and Sharon knew it” then Sharon would NOT have claimed ownership of songs that “the other guys” wrote.. The strength of Ozzys solo career has been based upon the PERCEPTION that he created songs that he simply played very little of a roll in writing. Ozzy and Sharon are life long thieves and liars PERIOD! It seems that John's (Ozzy) major musical contribution(s) to the songs he has sung are: vocal melodies, song title's and a line here or there (pun intended). Ozzy had a great/unique vocal delivery but without the other band mates (i.e. Geezer, Iommi, Randy, Daisley, Jake), would Ozzy be "nothing"? Ozzy needed them and they needed Ozzy, a perfect circle for musical creation. But he loves ice cream. I really liked the stuff sabbath did with dio and all, but you can hear the difference in chemistry. When a band goes into a studio, regardless of the volume of material each member contributes, unless someone is a total slacker, the inspiration is there and is a sum of the whole. At my day job I was just talking with one of our managers and she mentioned that her "kids" (late teens to young adults) really like the older stuff. I live across the country from her and my kids also really appreciate the older music - late 60's - 70's and some 90's. It's weird since thinking back on my youth, I wasn't really into stuff from 30 years prior. Now stuff 200 years earlier - Baroque thru Romantic... OK. I mentioned to her that one of the things about recording during those times was the magic and the way stuff was a lot less contrived sounding. You'd walk into the control room and studio with an idea in mind and rarely is it what you walked out with. Nowadays with DAWS and the amazing ability to do editing we only could have dreamed of back then, it's almost being abused to a point of killing the magic. In the 1980's I was working a live show for a band I'd produced and was talking to a club owner. At the time I was doing a lot of sessions - most that sucked. Lot of control freaks - those were usually the ones that bit it the worst. The one band I was producing I had brought up through the years from small demos to major productions. They got to point that they'd go in with an idea - just let it happen and everything was usually one take. So I asked this club owner - who's real religious about why some bands had that magic - and some just sucked - usually the ones that wanted 30 takes of the word "the" on some vocal for some schlock tune. "You can tell things touched by the hand of man and those touched by the hand of God...."
"So you're always waiting for those special moments, trying to produce chemistry between people in whatever situation is right for them. Some artists need to be uptight to really perform, with their adrenaline at it's peak; others need to be relaxed, yet in the end there's no guarantee that 28 or 29 takes will necessarily produce that magic. In fact, the entire entertainment industry is about trying to "bottle lightning". There's also a saying we have in the studio that goes: you have to leave space, after you've done your homework, to let the Lord walk through the room." "Mitchell: There's a wonderful story about that in The Second Book of the Tao. Ch'ing the master woodworker carved a bell stand so intricately graceful that all who saw it were astonished. They thought that a god must have made it. The Marquis of Lu asked, "How did your art achieve something of such unearthly beauty?" stand, I concentrate my mind. After three days of meditating, I no longer have any thoughts of praise or blame. After five days, I no longer have any thoughts of success or failure. After seven days, I'm not identified with a body. think that my work must be superhuman." So think in those terms... it might not be apparent at first. After a bit of WTF? they finally got him out of there and on to the gig. "You'd have done me, eh?" Ozzy mentioned as to his appearance in women's clothing. As to Ozzy's creativity - I'll defer to my previous posts of Jim Vallance's interview. Okay, we get it. You don’t like Sharon nor Ozzy. Why not find a thread for an artist that you do like and do us all a favor. I don't know anything about the Ozman other than that he changed my life when I heard Never Say Die and Speak of the Devil as a little s**t kid. Thank you for the music, you mad bugger. Max Norman, one of the producer's of DOAM, said in an interview last year, that he had been approached after the tracks were done, and asked to strip the bass and drums off them. He told them No, as it would screw up the then unreleased album. Tommy Aldridge confirms that, saying he was given tracks to learn to play, and was asked if he could improve on them. He said he wouldve like to try, but the drums sounded perfect as they were, and he didnt want to screw up what he was listening to on the tape. DOAM tracks were laid down Feb/Mar of 1981, following the 1st UK tour, and before the initial tour of the States. Kerslake/Daisley were canned before that first American tour, which started April 22nd in Maryland. There was a publicity shot that had Blizzard of Oz on it, but the booking and tickets for the UK shows advertised them as Ozzy Osbourne in big letters and Blizzard of Ozz in smaller print below that. Names were all mis-spelled a lot on the various UK tickets. The initial date in the US, minus Kerslake-Daisley, was billed as Ozzy Osbourne. A couple dates later in Passaic, NJ the band was billed as Ozzy Osbourne's Blizzard of Ozz. Unfortunately I didnt get a second chance. I was scheduled to work the show at the Orange Bowl that was the next show after the Orlando show, that was where the plane accident occurred. Doggiedogma and Isn't Anything like this.